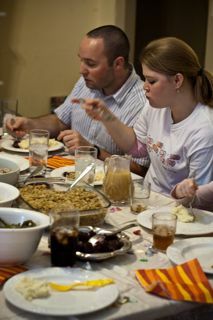 Sunday we (our team) celebrated Thanksgiving. It was a great day filled with turkey, two dressings, two kinds of green beans, and two pecan pies, plus tons of other fat filled foods. It was all really yummy too! After we all recuperated from gorging ourselves some of us played RISK, which Jason ended up winning. It was a good day with good food and good people. Pre-meal game of “Where’s MacKenzie”. 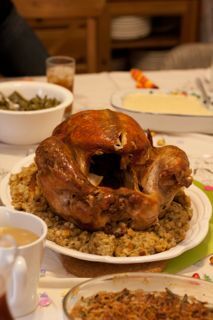 Thank you Charlie for cooking an excellent turkey. 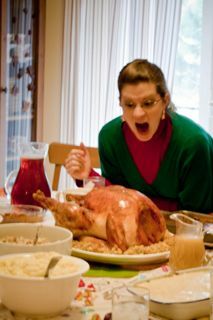 We all “gobbled” him up. Sorry, I know that is cheesy but I couldn’t help it. Well, maybe could…. 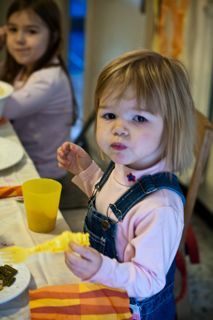 Alessia had a full plate but only wanted mashed potatoes and turkey, which she argued was chicken and what she wanted was TURKEY, NOT CHICKEN! Ben. 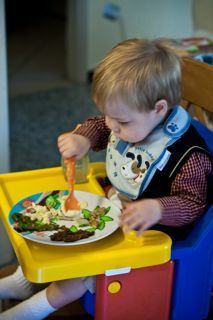 He was dressed in a cute sweater vest and looked like a little man. Emma tried to make his hair part on the side. Her efforts were in vain. I had a picture of the other two but Blogger wouldn’t upload them. Hmmm….look at all that wonderful, glorious food that makes me gain like 10 pounds. 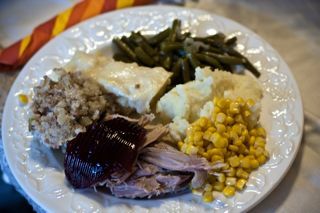 I’m pretty sure there are layers of food on that plate, all of which I was happy to consume. 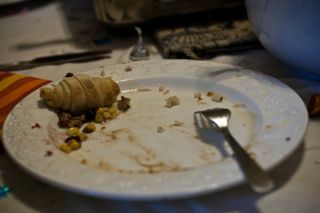 And this is my plate after I finished. Told you I was happy to consume. 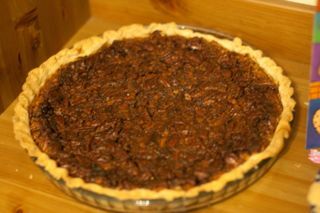 It’s just not a holiday without chocolate pecan pie. We also had regular pecan pie, chocolate chess pie and a pound cake. Everybody needs some zzzz’s after a long day of cooking and eating. 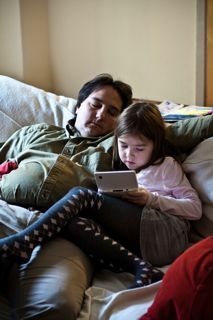 This pretty much sums up the entire day. ahahahahahah that one of m. is sooo funny. hahahahhahaha that last one is funny!!!!! !